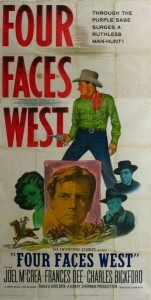 An independent production, in which McCrea had a hand. This is an excellent part for him, using to good effect the basic decency he always projected. 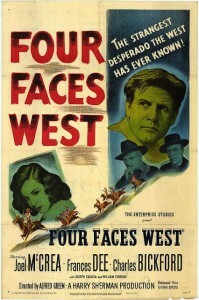 The title’s not great; it’s not clear who the four faces are. It’s kind of a generic title that doesn’t fit the story. Presumably McCrea (as Ross McEwen), Frances Dee (McCrea’s real-life wife, playing romantic interest and nurse Fay Hollister), Charles Bickford (as Pat Garrett), and Joseph Calleia (as Monte Marquez, looking nefarious but maybe not). Look for William Conrad in a bit part as a sheriff pursuing bank robber McCrea. Based on a story (“Paso Por Aqui,” first published in 1926) by Eugene Manlove Rhodes. From a vantage point sixty years after its release it seems to have a sentimental Christian morality from the era about it. (Compare it to John Ford’s 3 Godfathers, for example.) Not much seen these days, but it’s good. 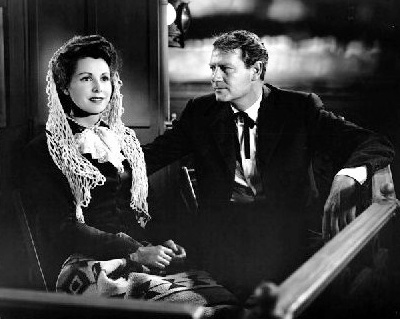 McEwen (Joel McCrea) meets nurse Fay Hollister (Frances Dee) on a train and is immediately taken with her. Ross McEwen is escaping from having robbed the bank in the small New Mexico town of Santa Maria. He committed the robbery when the bank refused to lend him the money he needs to help his father–$2000, for which he leaves an IOU signed “Jefferson Davis.” He is bitten by a rattlesnake shortly before boarding a train, and on the train he is tended by railroad nurse Fay Hollister, with whom he falls in love. She figures out that he is the man wanted for the bank robbery as they travel together on the train to Alamogordo, and she urges him to turn himself in. He gives her a ring and a kiss but takes off for the border. Although he took only $2000, the vengeful banker has offered a $3000 reward for McEwen, dead or alive. Much of southern New Mexico gets involved in the manhunt, it seems. 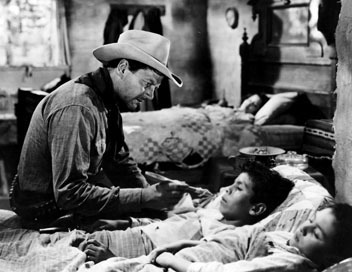 An ambiguous Mexican gambler Monte Marquez (the Malta-born Joseph Calleia), whom he also met on the train, ends up helping McEwen and being helped by him. When McEwen wins a substantial amount of money at Marquez’ gambling tables, he sends much of it back to the bank in Santa Maria to start repayment of what he took. Nurse Hollister tries to talk McEwen into giving himself up. At the end, it looks like he’ll go to jail, but maybe not for long. And Nurse Hollister will wait for him. As a western, this is better than average and well worth watching, despite the slightly snarky tone of this summary. It’s visually arresting. The cinematographer was Russell Harlan, who did Red River and many others as well. 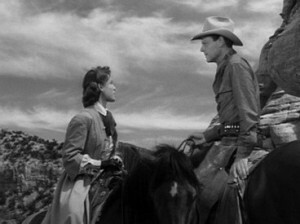 And no actor looked better on horseback than McCrea did. McEwen risks diptheria and capture. Interestingly enough, the film’s end is different from that of the Manlove story on which it is based. While the film ends with Garrett taking McEwen into custody, albeit with humane intentions, the original story ends with the two men gathering firewood together and not acknowledging each other’s true identities. A nurse from the East learns that this is the way of the West. The story’s end is better. The story takes its time developing, and it is the sort of thing that would not be made today, more than sixty years later. But it’s good. 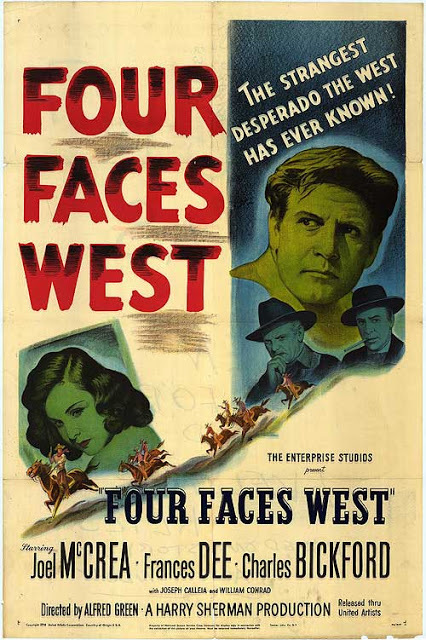 This is the better of two westerns in which McCrea stars with his real-life wife Frances Dee. For the other, see Wells Fargo (1937). For another good western with the excellent Joseph Calleia as a maybe-not-so-bad guy, see him as a Mexican bandit chieftain in Branded (1950), with Alan Ladd. 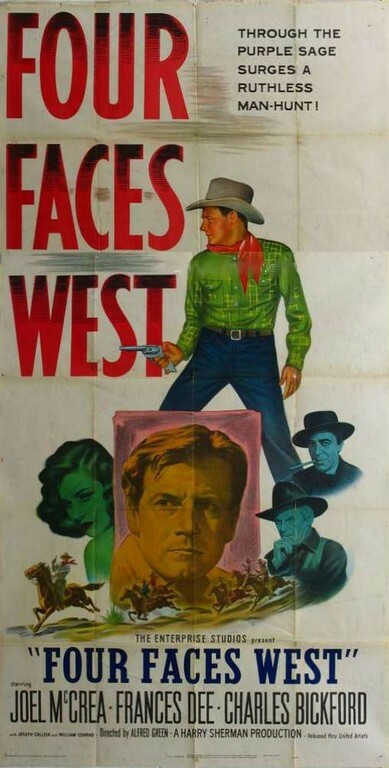 Not to be confused with 1940’s Three Faces West, starring John Wayne, or Two Flags West from 1950, with Joseph Cotton, Jeff Chandler and Linda Darnell. In the John Wayne film, he’s the leader of a town in the 1930s that takes in a doctor fleeing the Nazis in Europe with his attractive daughter. The entire town has to flee the dust bowl of the southern plains and head for Oregon. Or Four for Texas, a ratpack western from the 1960s with Frank Sinatra and Dean Martin. This entry was posted in Westerns Worth Watching and tagged Joel McCrea, Manhunts on December 27, 2013 by Nicholas Chennault.